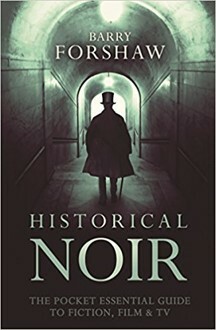 Barry Forshaw’s critical eye continues its award-winning examination of literature’s Noir edge but this time, it looks back through history rather than from his usual geographical demarcations such as Brit Noir, Nordic Noir, Euro Noir, American Noir. As well-read as we may consider ourselves to be, picking up this remarkable book makes us realise just how diverse is the Crime and Thriller Genre, which now is the UK’s biggest selling fiction genre [beating General & Literary Fiction in terms of sales for the first time in 2017]. Though concise, Historical Noir punches well above its page count through a combination of judicious editing and fascinating content. Though most people when pondering upon the definition of Historical Fiction, consider it to relate to work from the 18th Century or work at least “fifty years” from today (deploying the Crime Writers Association’s criteria in eligibility for entry into the CWA Historical Dagger Award). Barry Forshaw, redefines his reach into the past, delving first into ancient times examining work from writers such as Lindsey Davis and her tales of Roman Noir, as well Ellis Peters’ Cadfael series as well as Umberto Eco and C.J. Samson. There is much interesting asides on historical work from writers not widely known for writing about a dark past, which makes this volume enlightening. The breadth of analysis from Forshaw is as wide as it is diverse, with nods to writers Stefanie Pintoff, Dennis Lehane, Shona MacLean, Antonia Hodgson, Chris Petit, Imogen Robertson, Graeme Macrea Burnett, Rory Clements, C.J. Sansom, Bernard Knight, Steven Saylor, Jane Finnis, John Hardwood among many others including Agatha Christie and the dark heart of the Golden Age. It was good to read incisively on the influence of Phil Kerr and the Bernie Gunther tales of pre-war, wartime and post-war periods of Germany, as well as contemporary work that is now considered to fit the dark heart of Historical Crime, such as the 1970s based Red-Riding-Quartet from David Peace that examined the context of the Yorkshire Ripper murders, contrasted against a changing Great Britain. Forshaw’s latest Noir collection is an essential volume for the Crime and Thriller aficionado, though I would guess he must be hard pressed where to focus next. My guess is that his next volume will be Future Noir, examining the perimeter where Science Fiction meets Dark Crime Fiction.